According to Dr. Deepak Chopra and Dr. Rudolph Tanzi, you are simply the sum total of the genes you were born with. You are the user and controller of your genes, the author of your biological story. No prospect in self-care is more exciting. 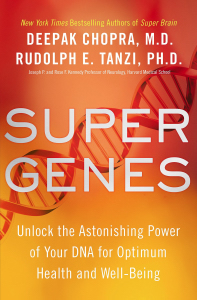 Learning how to shape your gene activity is at the heart of this eagerly anticipated book from the duo behind Super Brain. That book, which became a bestseller around the world, was also a hit PBS special viewed by millions in the United States. For decades medical science has believed that genes determined our biological destiny. Now the new genetics has changed that assumption forever. You will always have the genes you were born with, but genes are dynamic, responding to everything we think, say, and do. Suddenly they've become our strongest allies for personal renewal. When you make lifestyle choices that optimize how your genes behave, you can reach for a state of health and fulfillment undreamed of even a decade ago. The impact on prevention, immunity, diet, aging, and chronic disorders is unparalleled. Daring and historical as well as practical and evidence-based -- with dozens of ways to begin changing your life now -- Super Genes takes a quantum leap into the frontiers of self-care. It will revolutionize how we understand ourselves and the health of those around us.